Rick (Christian Bale) is a screenwriter living in LA. He moves from party to party, woman to woman. He seems to be looking for something, but who knows for what? I don’t like Terrence Malick movies. I decided to watch this one anyway because Cate Blanchett! Christian Bale! Natalie Portman! And so many other actors I love. 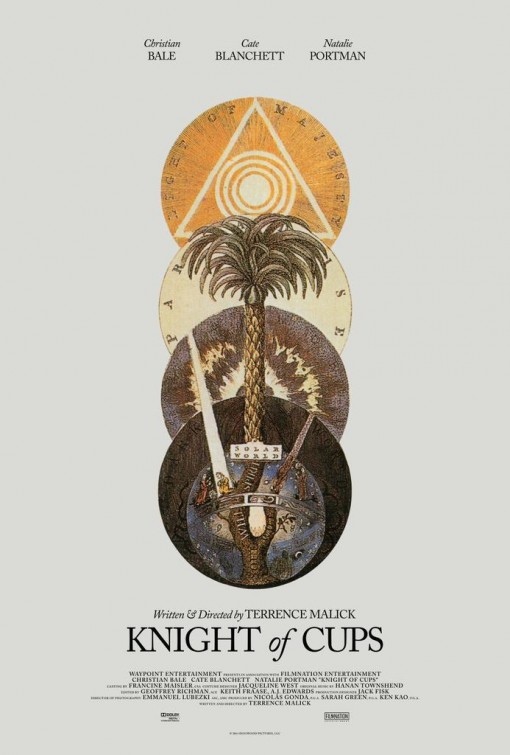 But it turns out that Knight of Cups is everything I hate about Malick movies turned up to 11, while nothing I used to still like about them works for me anymore. What I don’t like about Terrence Malick films: voice-overs, esoteric babbling, slow slow slow boring slow slow pacing. What I usually do like about them: the amazing cinematography. But in Knight of Cups even the cinematography didn’t manage to take me in. For whatever reason, they decided that faces and facial expressions were mostly important. So while we often get gorgeous stationary shots of landscapes, whenever a character enters the frame, the camer mostly just starts weaving around them, constantly moving, never really focusing, never really showing us their faces, and I hated it. I want to see what is happening with the characters. I can’t see it, when the camera moves from behind over their shoulders, turns around and moves into their chests. But not only that the camera work didn’t work for me, the sound was even worse. Not only that there are barely any dialogues – instead we are stuck with incessant voice-overs that come from three different voices in three different layers. One wasn’t enough I guess. But even in the few instances that we do get actual dialogues, tone and image are not aligned, the dialogues fade in and out. Especially in combination with the lack of focus on faces, this is infuriating as it makes it impossible to connect with what’s going on in the film right then and there. I assume that Malick wanted to portray Rick’s alienation from the world. But while that is rather effectively set in scene, the effect is that the audience feels alienated from Rick and the film. As the film pushes you away, you can’t help but wonder why you should feel with Rick in the first place: a handsome, rich and successful white man, he’s not exactly the first person my sympathies extend towards. And since the film successfully alienates the audience, no other reason makes itself readily available. The end result is a mess: a boring film with pseudo-depths and esoteric commonplaces that squanders all the talent that was involved in the film. I wish Christian Bale would make good movies again. Summarizing: I felt like my brain was leaking out of my ears. If that’s what you want to experience, by all means, go for it. This entry was posted in movies and tagged 2015, Antonio Banderas, Armin Mueller-Stahl, Ben Kingsley, Brian Dennehy, Cate Blanchett, Christian Bale, Clifton Collins Jr., Freida Pinto, Imogen Poots, Isabel Lucas, Jason Clarke, Joe Lo Truglio, Joe Manganiello, Joel Kinnaman, Katia Winter, Kevin Corrigan, Knight of Cups, Michael Wincott, Natalie Portman, Nick Kroll, Nick Offerman, Nicky Whelan, Ryan O'Neal, Shea Whigham, Teresa Palmer, Terrence Malick, Thomas Lennon, Wes Bentley by kalafudra. Bookmark the permalink.